We Are EG : S1E6: "There's No Feeling Like Skateboarding"
S1E6: "There's No Feeling Like Skateboarding"
On this episode of We Are EG, Ryan Asmussen sits down with fellow EG English teacher Matt Snow and two students to discuss skateboarding. Matt was at one time a semi-professional skateboarder and is currently the sponsor of the EG Skate Club. Click here for a Daily Herald article about Matt Snow. 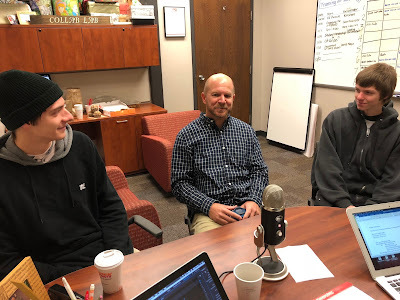 This episode was produced and edited by Ryan Asmussen with help from Bruce Janu.